1. It contains apples, which are symbolic of a sweet (a.k.a. good) new year. 2. I like tarts better than pies. 3. The top is pretty and fun to make. 1. In a large bowl, sift together the flour, confectioners’ sugar and salt. Scatter the butter pieces over the flour mixtur and toss with fingers or a fork to coat in the flour. Using a pastry blender or 2 knives, cut in the butter untill the mixture forms coarse crumbs about the size of peas. 2. In a small bowl, lightly beat the egg yolks with a fork, then stir in the cream until well-blended. Drizzle this over the flour mixture and stir with the fork until the dough is moist and comes together in a smooth, well-mixed mass. 3. On a work surface, shape the dough into a 6″ disk. Wrap in lastic and refrigerate until firm, at least 45 mins or up to overnight. 4. Remove the dough from the refrigerator. Lightly dust the work surface and a rolling pin with flour. Roll out the chilled dough into a round about 13″ in diameter and 3/16″ thick. Work quickly to prevent the dough from becoming too warm. 5. Line a 9 1/2″ tart pan with a removable bottom with the rolled out dough and freeze crust until firm, about 30 mins. Preheat the oven to 400oF. Prick the bottom of the crust with a fork all over and line it with foil and fill with dried beans, uncooked rice or pie weights. 6. Bake the crust until it dries out, about 15 mins. Remove the weights and foil. Lower the oven temperature to 350oF and continue to bake the crust for about 5 mins longer, until the edges are lightly browned. Remove and let cool completely. 1. Position a rack in the middle of the oven and preheat to 375oF. 2. Line a half-sheet pan with parchment paper. In a large bowl, stir together the apple pieces, sugar, lemon juice, cinnamon, and melted butter until well mixed. Spread the mixture in the prepared pan. 3. Bake the apples until they are soft, about 20 mins, stirring once about halfway through. Remove from the oven and scrape the apples into a bowl. Using a spoon, mash the warm apples until there are only a few chumks left and they resemble chunky applesauce. Let cool to room temperature and spread in the prepared crust. 1. 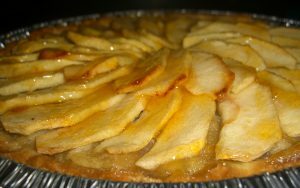 Arrange the apple slices in 2 circular rows on the filled tart pan, slightly overlapping them to cover the filling completely. Drizzle with the melted butter and sprinkle with sugar. 2. Bake the tart until the apple slies are soft when pierced with the tip of a knife or a toothpick and the edges of the crust are browned, 45-50 mins. Transfer to a wire rack to cool. 3. In a small pan over medium heat, warm the apricot preserves until melted, about 3 mins. Strain through a medium-meshed sieve and, using a pastry brush, brush the apple slices with the preserves. Unmold the tart and serve at room temperature. Next Next post: Cream Puffs!